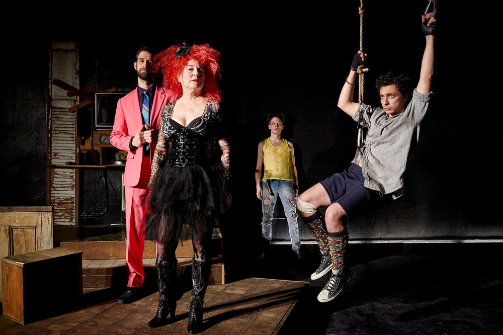 Patrick Darwin Williams, Kate Skinner, Declan Eells, and Jade Ziane in The Remarkable Rooming-House of Mme. Le Monde. BOTTOM LINE: A satisfying albeit troubling look into the mind of later-life Tennessee Williams. It’s hard to call these two short plays, A Recluse and His Guest and The Remarkable Rooming-House of Mme. Le Monde, new. Yes, the company bills them as premieres, though they’re part of the parade of “new” work by Tennessee Williams (who died in 1983) that was found at the bottom of some drawers and is just now being published. Yeah, it’s kinda like somebody publishing your diary after you're dead. Recluse tells the story of a beggar woman (Nevrika, played by Kate Skinner) who travels around quite a bit. She’s looking for a room but also an eligible bachelor. Not entirely a catch, she learns of a recluse (Ott, played by Ford Austin) who may be interested. Well, he's available anyway. There’s trouble in the waters right from the start, although they do seem an oddly appropriate pair. But there are ominous mentions of some poetic “smoke in the house” that will bring an end to this affair. It’s a bizarre little play that feels more like an elaborate sketch. The Remarkable Rooming-House of Mme. Le Monde is the more successful of the evening. The fabulous Kate Skinner is back for more as Mme. Le Monde, who runs a rooming house for boys. At least one of them is her own, The Son (Declan Eells, who fits tremendously in the world of Williams.) The Son has a knack for abuse of a sexual kind, particularly with the severally disabled Mint (an athletic, commendable Jade Ziane.) Mint is entirely paralyzed from the waist down and is offered a series of wonderfully designed hooks on ropes (by Justin West) that allow him to lifelessly hang around the house and, sort of, move across the stage. It’s awful. And some powerful poetry. Hall (played by Patrick Darwin Williams) is a kind of bizarre baby sitter, consuming Mint’s rationing of tea and biscuits. Oh yeah, it’s set in London, an unexpected dialect to hear Williams in for sure. Remarkable Rooming-House is the play to come for. It’s dirty, provocative, and feels like a guilty pleasure provided to us by The Playhouse Creatures Theatre Company. That said, these plays are admittedly sparse. Williams died (ingloriously choking on a bottle cap) in 1983, so they come very late in his troubled life. They feel like ideas of larger plays—strategies for Williams to relieve some stress. And the poetic restraint you may be more familiar with in classics like The Glass Menagerie is replaced here by that which is brash, loud, and cluttered. For Williams' devotees especially, this is certainly what makes them so fascinating—Williams junkies might indulge in these plays in the same way they might read John Lahr’s recent biography on Williams, Mad Pilgrimage of the Flesh, a work that reads like vintage erotica and tabloid magazines. We’re not too far off with these desperate plays, which you can imagine being written in an alcohol-fueled, drug-induced evening of debauchery. And you’ll love him even more the same. The design team inhabits this world of excess with many disparate pieces, creating a junkyard of a set complete with television monitors, colors, gobos, and crazy costumes. Particularly with Recluse, the musical underscoring is loud, the dialogue is sometimes shouted, and nuance and delicacy are completely lost, for better or worse. It feels like Williams is yelling through this production to be heard again, one last time. Director Cosmin Chivu does right by the everyday poetry of the language by leaning away from it, placing the words firmly and confidently in the actors’ vernacular rather than allowing too much indulgence. There’s a lot to sift through here. The best way to describe how I felt leaving these one-acts is “icky.” Wrongful abuse and isolation remain at the core of these works, with characters desperate for a gentler love or even decency. They feel suitably brash in our contemptuous American climate at present, though underwhelming as plays; they are even, some may say, inappropriate for the stage at all. It’s a strange way to honor an amazing writer—to display the lesser works on a grand scale. But perhaps Williams is loving that we still care. Tennessee Williams 1982, comprised of A Recluse and His Guest and The Remarkable Rooming-House of Mme. Le Monde are one-acts written by Tennessee Williams. They are directed by Cosmin Chivu. Scenic design by Justin West. Lighting Design by John Eckert. Costume design by Angela Wendt. Original music by Paul Brantley. The Production Stage Manager is Tara Griffo. Joseph W. Rodriguez is the Producing Artistic Director. The casts feature Beau Allen, Ford Austin, Declan Eells, Kate Skinner, Anne Wechsler, Patrick Darwin Williams, and Jade Ziane.